AMC said that it had commissioned a "comprehensive assessment" before letting Hardwick back on the show. LOS ANGELES — Chris Hardwick will return as host of AMC's "Talking Dead" series following an investigation into allegations that he was abusive to former girlfriend Chloe Dykstra. Hardwick will return as host of "The Walking Dead" and "Fear the Walking Dead" aftershow as of Aug. 12 for the "Fear the Walking Dead" midseason premiere. He was suspended from the role by AMC last month after Dykstra penned an essay accusing Hardwick of being emotionally and sexually abusive during their relationship. "Following a comprehensive assessment by AMC, working with Ivy Kagan Bierman of the firm Loeb & Loeb, who has considerable experience in this area, Chris Hardwick will return to AMC as the host of 'Talking Dead' and 'Talking with Chris Hardwick.'" AMC said in a statement. "We take these matters very seriously and given the information available to us after a very careful review, including interviews with numerous individuals, we believe returning Chris to work is the appropriate step." AMC has still not set a date for the return of "Talking with Chris Hardwick," the season premiere of which was pulled from the network's schedule following Dykstra's accusations. AMC tapped Yvette Nicole Brown to sub for Hardwick as the interim host of "Talking Dead" amid the initial uproar over Dykstra's claims. Brown, a frequent and popular guest on "Talking Dead," will remain the host of the Aug. 5 "Walking Dead" Season 9 preview special. Hardwick will be at the helm of "Talking Dead" following the midseason premiere, with Brown now set to appear on that show as a guest. 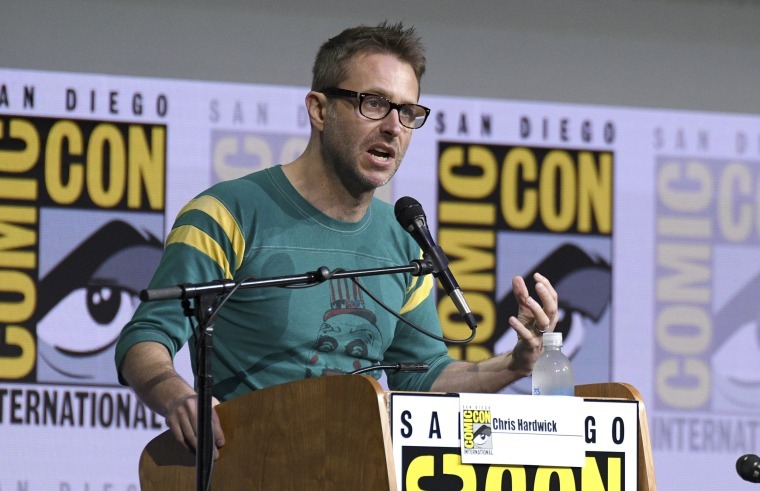 Last week, Brown served as the moderator for the San Diego Comic-Con panels for both "The Walking Dead" and "Fear the Walking Dead," a role Hardwick has held for years. "Talking Dead" has become a mainstay on the network and frequently ranks as one of the top-rated cable shows of the week. The show debuted during the second season of "The Walking Dead" in 2011 and began after airing "Fear the Walking Dead" as well in 2016 during that show's second season.